This romantic composition was painted by Vedernikova from Fedoskino. It shows the date of a girl with a lad. They stand, leaning their elbows on the fence, and talk. May be the subject of their conversation is the first declaration of love. The two lovers gaze at each other tenderly, and look a little confused. The airiness and spaciousness of the countryside unfolds around them. 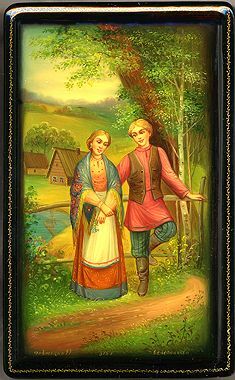 Wooden peasant's houses on the riverbank, boundless meadows and fields, the idyllic forest, full of flowers, shrubbery and trees make up a beautiful view, which fit perfectly for the first declaration of love. The two characters are drawn very naturally and with a great amount of feeling. Their appealing faces are painted so skillfully that we can read on them different emotions and thoughts; their colorful peasant's costumes are painted with a lot of details. The palette used is based on earthtones that help to reproduce a rural landscape; the exception is the bright-multicolored clothes of the characters. With the help of artistic means the artist has managed to accentuate charm and youth of the characters, their elevated and romantic mood. The box is constructed from paper-mache. Black lacquer covers the exterior and red lacquer covers the interior of the box. The composition is framed with gold scrollwork. The sides of the box are adorned with the beautiful gold floral patterns highlighted with red and white oil paints. A hinge is fastened to the left of the composition. The Fedoskino "troika" insignia can be found on the interior of the lid. The box rests on a flat bottom. It is signed with the name of the artist, village and year (1997).